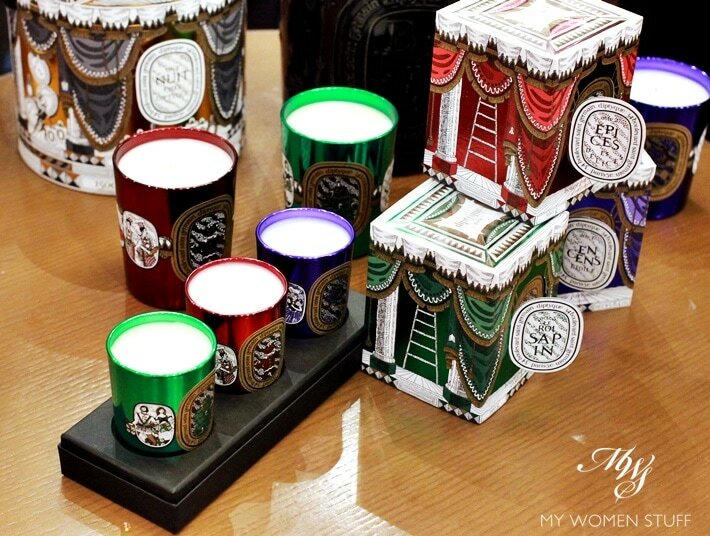 First off of course, are the Diptyque Christmas candles. They come in 3 limited edition scents, in beautiful limited edition metallic jars. 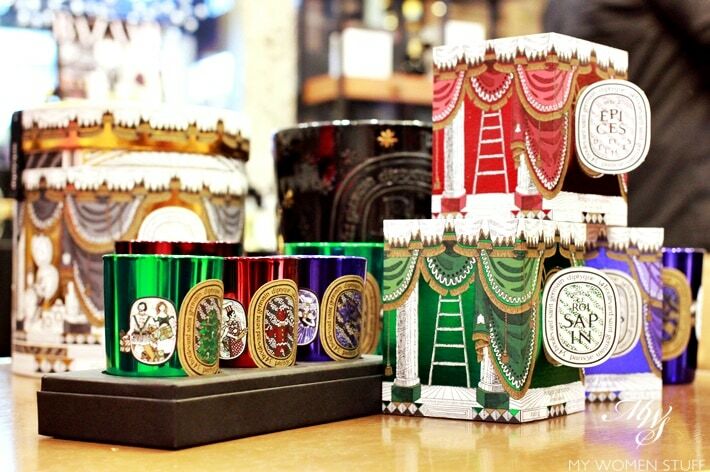 There is a theatrical feel about the design, and the full size candle boxes come with an outer sleeve, with a pull open window, giving you a peep at the design. Very well executed. Epices et Delices (Red) – A gingerbread scent captured and distilled from 1.5 tons of freshly baked gingerbread cookies! I was absolutely fascinated by this as it didn’t have a heavy buttery scent, the way cookie-based scents tend to smell. There is that spiciness you associate with gingerbread coming through in a most intriguing manner. Le Roi Sapin (Green) – This is your classic Christmas scent of pine. One sniff, and you’d nod your head going “Yep, that’s the smell of Christmas right there!” That’s what I did anyway. I was told that this year’s Sapin scent is that of a Balsamic Fir, so it has been slightly tweaked from previous years’ offerings. The mini candles are sold separately or in a coffret set. The thing with Diptyque’s mini candles, I’ve found, is that they are really meant for small enclosed rooms, unless you burn a few of them together. In a larger area, you’re basically just wasting money, so don’t do that. I bought this one year when it wasn’t carried locally, and I have to say that while I’m not crazy about it due to the fact that I made the mistake of burning them in my living hall (too wide a space for the scent to cover so it dissipated too quickly). In a smaller, enclosed, or better yet, air-conditioned room, it smells much stronger and scents the air better. I’m quite interested in this one, personally speaking. What you get in a box, are 5 spray minis of 7.5ml Diptyque scents. Like the Jo Malone set I showed you a few days ago, this one from Diptyque similarly allows you to sample 5 of Diptyques iconic scents, to work out what works for you, or what doesn’t. Diptyque scents are a little different, I feel. They aren’t your usual pretty perfumes, so they can take some getting used to. A sampler pack is a nice way to be introduced to a brand, and I like that it comes in a spray! There are a couple more items in store you can check out, but these were the ones that really caught my attention. Will you check out the Diptyque Christmas offerings? NEXT POST: The Dr. Brandt Power Dose Vitamin C might be small but it sure is mighty good stuff! The holiday candles are so pretty that I’d feel obligated to give them as gifts rather than buy for myself. I’m a big fan of L’Artisan Parfumeur candles so I will probably check those out first.